As diesel trains are cheaper, they have been used for many decades. Diesel trains pollute the atmosphere, leading to global warming. Besides, diesel is a fossil fuel which is fast running out. Though electric trains are also eco-friendly, the cost of electrification is quite high. Many governments these days are strained by their budgets and do not have the resources to electrify their trains. And the need for sustainable transportation is crucial now, as the world has realized the harmful effects of global warming due to manmade reasons. Many parts of the world are already reeling under the effects of climate change as a result of the planet heating up. Diesel trains are a major contributor to air pollution, but due to the cheaper cost, are still plying all over the world. To fight global warming, zero emission hydrogen trains could be the perfect train transport. Hydrogen powered trains may be the future of locomotives all over the world. Hydrogen behaves a lot like diesel and has a high energy density. It takes just 15 minutes for refueling a tank. On trains, more than one hydrogen tank can be added depending on the distance it has to cover. What is a hydrogen powered train? The Coradia iLint was manufactured using the latest eco-friendly technology. It was equipped with a number of fuel cells, which produce electricity. Electricity is produced by combining hydrogen and oxygen (extracted from ambient air inside the tank), which is a very eco friendly process, as only steam and water are emitted. The electricity produced powers the electrical traction system of the train which controls the train’s movement. According to Alstom, the makers of the world’s first Hydrogen powered train, the extra electrical energy which is produced in the hydrogen tanks will be stored in the lithium-ion batteries situated on the underside of the train. The auxiliary converter will be used to convert the energy for a range of on-board applications, such as door systems, information displays and air conditioning. This train is thus one of the most sustainable transportation the world has ever seen. Fuel efficient – Apart from clean power generation and clean emissions, iLint’s other advantages are its smart, efficient power management and flexibility of electricity storage. 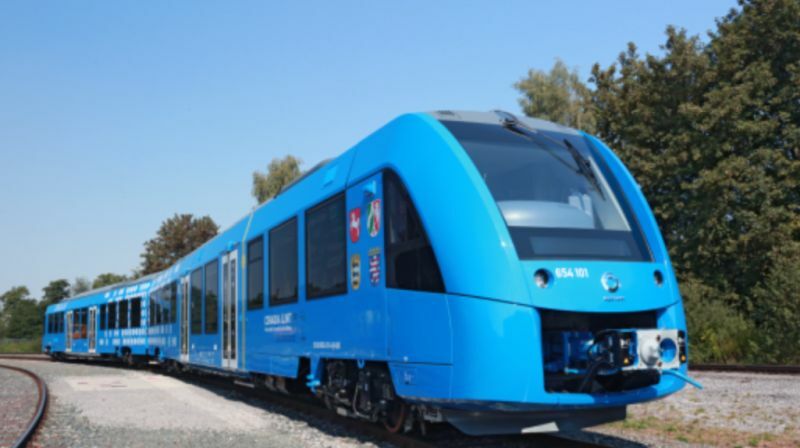 The hydrogen tanks supply electricity on demand – which means that the fuel cells operate fully only when required, for example when the train accelerates over a sustained period of time. At other times, when train brakes, the hydrogen cells are powered down almost completely, saving on the consumption of hydrogen. This green innovation will therefore be extremely fuel efficient. Hydrogen is going to be pumped into the train from 40 ft high stainless steel container kept next to tracks at the Bremervoerde train station. With just one tank of hydrogen, the train can run the whole day. The energy derived from braking is managed intelligently too, enabling iLint to match top speeds of the latest Coradia Lint DMUs, which is 140 km/h. This amazing train using the latest eco-friendly technology will be able to cover a distance of 1,000 km on one, single hydrogen tank and ferry upto 300 passengers. Diesel trains generate 1.2 MW power, whereas the iLint needs just half that amount to run. This is due to the better torque provided by the electric motor of the train. Cost-efficient – As the world’s first Hydrogen powered train is basically FCEV, its maintenance and fuel costs are significantly lower than other trains. The Coradia ILint may be more expensive to manufacture, just as other electric vehicles, but the running cost is much cheaper, so that the manufacturing cost can be recovered over time. Besides the train has a modular design, so that if any part malfunctions, it can be easily swapped with a new part. According to the manufacturers, the hydrogen powered trains can recover the cost within ten years. Appearance – The look of the train has been intentionally kept as simple as possible, and the bright blue trains look just like other trains. 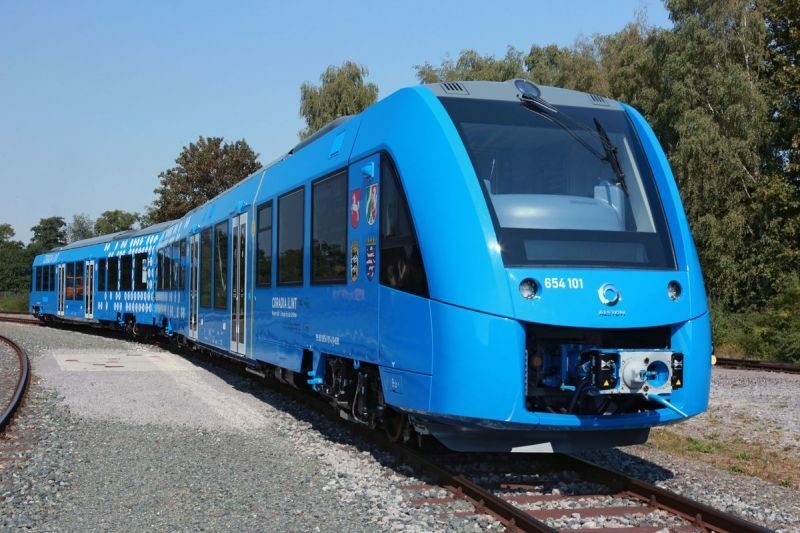 The manufacturers deliberately did not make changes to the outward appearance, to convey the message that the regular diesel train structure does not have to change in order to incorporate the hydrogen fuel cells. Zero emissions – The world’s first Hydrogen powered train is free of emissions, and depending on the method of obtaining hydrogen, it could be have a zero carbon footprint too. It makes very little sound compared to other trains, so it contributes very little to noise pollution as well. This incredible green innovation is thus eco friendly for its green fuel, green emissions and silent running. Alstom is working on ways to produce the hydrogen gas required for the world’s first Hydrogen powered train in a sustainable way. One of the methods is electrolysis, in which hydrogen is produced by splitting water into oxygen and hydrogen. The other method is natural gas reformation – it involves combining the methane in natural gas with very hot steam. The company also aims to mitigate CO2 emissions from its hydrogen production process with the help of wind energy. To meet climate protection targets, and to avoid the electrification costs, other countries might follow Germany’s example and introduce world’s first Hydrogen powered train in their train services too. In fact, this seems to be one of the best solutions for green locomotives, provided the hydrogen is sourced responsibly.